If you need to shred CD/ DVD’s and Paper at the highest security level. 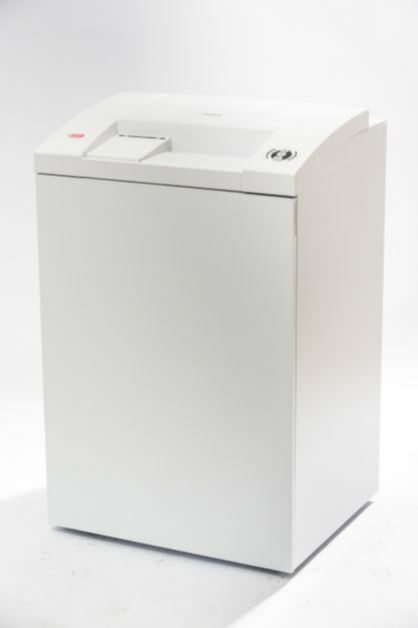 intimus introduces the intimus 175 hybrid high security shredder. The intimus 175 hybrid is our first shredder which combines both functions in one machine. The intimus 175 hybrid meets the requirements from international security authorizations as the US NSA or the German BSI. This machine meets the requirements of the highest security level of DIN standard 66399. The operation of the intimus 175 hybrid is based on the proven i-control. This controls the shredders functions and provides visual information for user clarity. The machine is also equipped with a solution to start and stop automatically. For optimum performance especially for the destruction of CD/DVD our machine comes with a new automatic oiling system. This ensures life time of trouble free operation. Oiling the cutting unit regularly optimizes the oil consumption. If the bottle is nearing empty the machine will automatically inform the user to replenish it. During the development of the intimus 175 hybrid, special attention was taken to ensure environmental friendly design. This dual function shredder with i-control is also equipped with the Ecologic energy management system, as a standard feature. Ecologic time responsive electronics puts the shredder into sleep mode after its been at idle for some time. Waste separation follows the sustainable approach. The separation of optical media waste provides the best conditions for recycling. With a size of 2,4 mm²* at Optical Media and 3,6 mm² at Paper, the intimus 175 hybrid exceeds the global standard for high security applications: Min. requirement for Optical Media • NSA (USA) Standard: NSA/CSS 04-02 = 10mm² • BSI (Germany) TL-3420 = 10 mm² * Particle length may vary depending on shredding material and ambient conditions. CPNI approved. USE plastic sack 99952 for the paper and 99977 for the optical media. Click here to download a data sheet.